The bronze statue of Buddha Amoghasiddhi is quietly sitting on Ngong Ping highland in west Lantau Island. 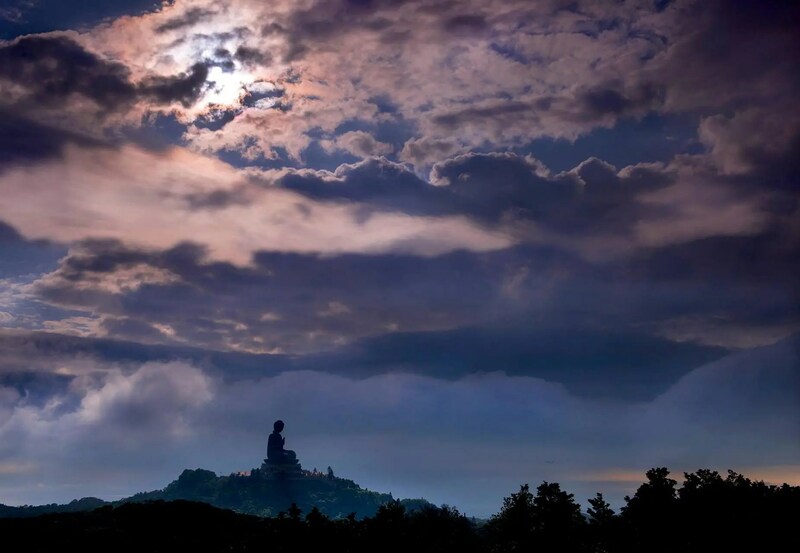 Erected in 1993, facing north (to China), the Big Buddha is 34 metres (112 feet) tall and the second tallest outdoor bronze seated Buddha in the world (The tallest one is Fo Guang Shan Buddha in Taiwan). Nowadays, the Big Buddha, together with Po Lin Monastery, Wisdom Path, Ngong Ping Village and Ngong Ping 360 Cable Car, is one of the most popular tourist attractions in Hong Kong. Lantau Peak, the second highest mountain in Hong Kong, is right next to the Buddha and is considered the best place to view sunrise. I will be visiting Hong Kong on Oct 8 and I hope to take a picture of Tian Tan Buddha with Hills and clouds, just like yours. Would you kindly advise me the location of your picture? When in the Lantau Trail? Do I go off trail? Hi Winston, if you want to take pics of the Buddha with hills and clouds, you can go directly to the Buddha, but do not stay with the crowds of the tourists, instead, explore the Wisdom Path and the small paths around it. You will find lots of good locations to take pics of the Buddha.